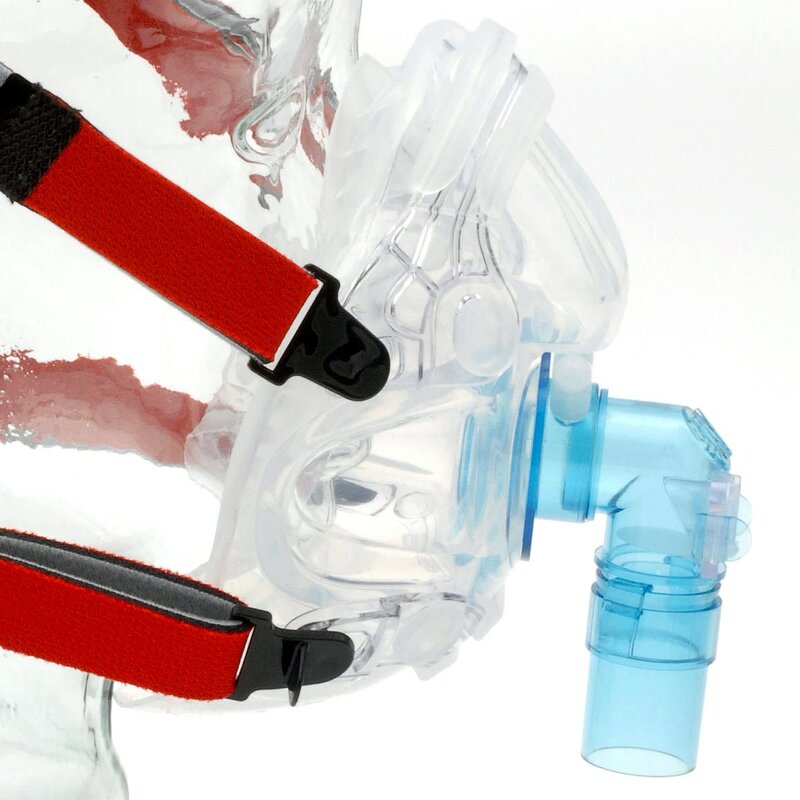 Hans Rudolph's 7600 Series V2 is a unique full face mask created from a single piece of clear soft silicone rubber. The 7600 V2's innovative construction requires no forehead support and its anatomically contoured cushion, soft inner membrane, and ribbed chin support combine to create a leak free, secure, comfortable fit. Easy To Fit, Easy to Clean! 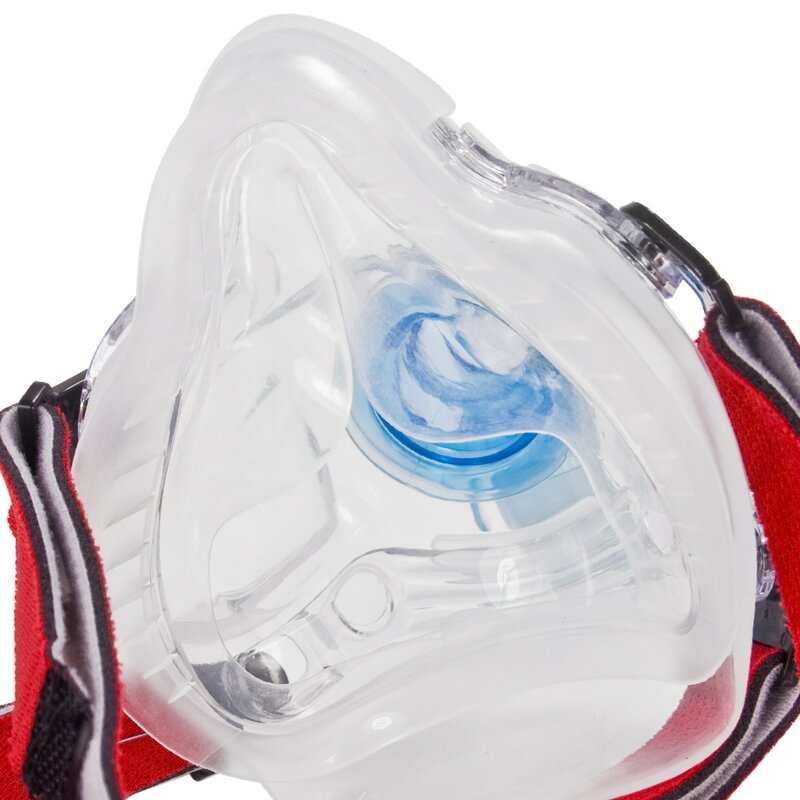 Single-Molded Mask Frame & Cushion: Unlike any other CPAP/BiPAP mask on the market, the Hans Rudolph 7600 V2 is made of a single anatomically contoured, molded piece of clear soft rubber. There is no hard plastic frame and there are no extra parts to detach, break or lose. 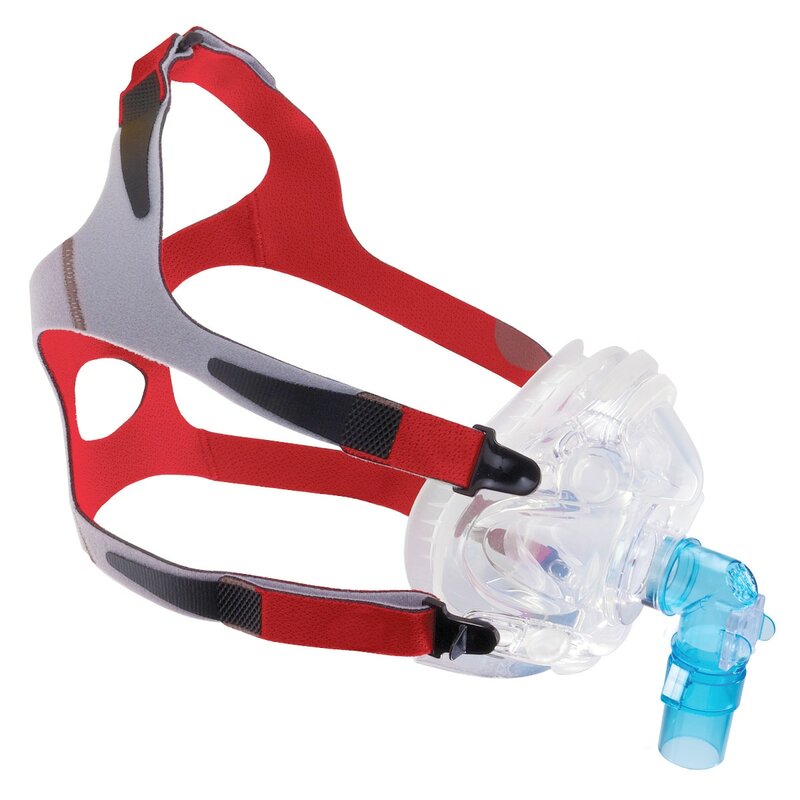 Because the frame and cushion are a single piece the mask is exceptionally stable on the face. So much so that it doesn't require a forehead support for stability! Soft, Contoured Cushion with Integrated Chin Support: The 7600 Series V2 mask is softer, lighter, and more comfortable than the original 7600 mask. The full face cushion has been updated to incorporate a soft membrane, inside the cushion, for improved fit and comfort. Support is also improved by a series of ribs around the base of the cushion; and the integrated chin support helps improve overall therapy while reducing leaks. Updated Headgear with Quick-Release Clips: The 7600 V2 Mask's updated headgear design is made of nylon covered, polyurethane foam straps with quick-release clips that slide easily into the mask frame. V2's 360° swivel elbow port comes with a detachable swivel adapter for quick removal of your hose if you need to pause therapy during the night; and repositioned micro-vent exhalation ports channel exhaled air away from the user during sleep..
Easy to Fit, Easy to Clean! The Hans Rudolph 7600 V2 is available in 5 sizes -- Petite, Extra Small, Small, Medium & Large -- to fit a very wide range of users. The headgear is also highly adjustable to a wide range of head sizes. Cleaning the V2 is a snap! The main body of the mask is dishwasher safe with long lasting materials. In The Package:Complete Full Face Mask Pack with Cushion (Petite, ExtraSmall, Small, Medium or Large) and Headgear. This is, hands down, the best CPAP mask I've found and I have tried many. It's pliable and forms to my face well. Most mask have a hard frame, this frame is non-conforming regardless of what seal is attached. The Hans Rudolph 7600 is very comfortable, and while I have come to the conclusion there is NO mask that is leak-proof, this one is the best as any leak is minimal. Its design is such that it cradles the chin, making the need for a chin strap unnecessary. Cleaning is easy, you can even toss it in your dish washer, after removing the headgear which attach by a snap. These snaps make it easy to put the mask on and take it off with out the need to mess with the adjustment. The only downside I have with the mask IS the headgear. I really wish they would find something other than neoprene. It's great when it's new, but over a short time, it will stretch out, requiring readjustment, and as it does, it actually becomes narrower, like a spaghetti strap, which cuts the skin. I end up having to replace the straps more frequently than the mask, which holds up extremely well. If not for the headgear, I would give this mask 5 stars. When considering this mask, there is a sizing guide. You should order one size smaller than the guide indicates. The masks runs larger than the guide would indicate. It comes in 5 sizes: petite, x-small, small, large & x-large. When I first tried this mask, I got the large by guidance of the fitting guide. It was way to big. The small fits me well and I am a big guy. I can't imagine who would wear the x-large. Sleep well! The subject says it all. Device hurts me when using. i purchased the v2 mask because i am a mouth breather. originally, i had a lot of problems with fit. my ears were crushed, my nose was sore .. leaks could be stopped by making the straps REAL tight.. i finally worked with strap position and followed the recommended proceedures and i am really happy now. 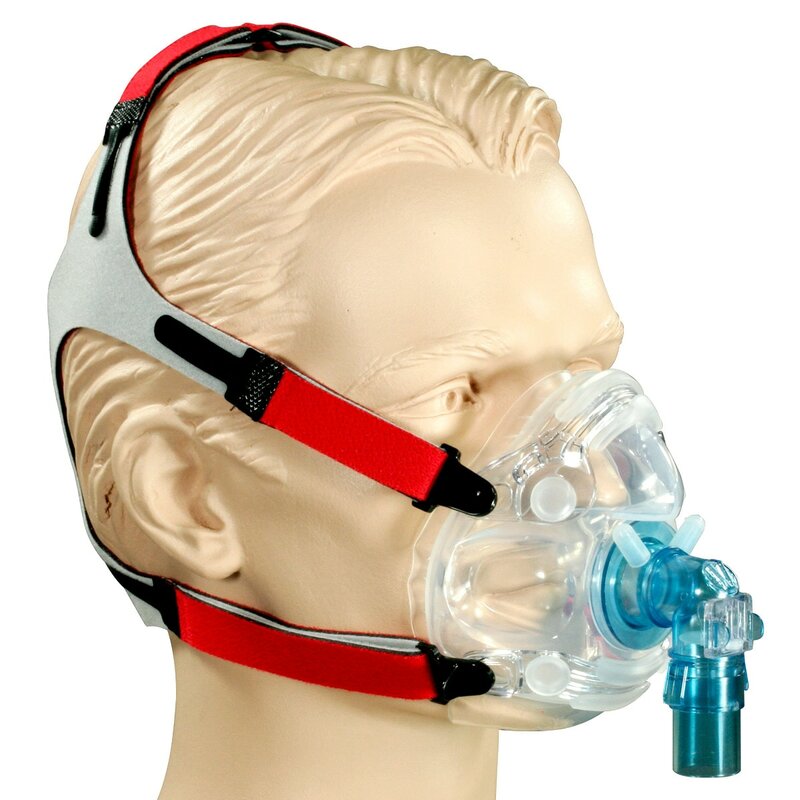 I've purchased several CPAP masks from this website and others over many years. I was pretty excited about the quality of this mask initially. 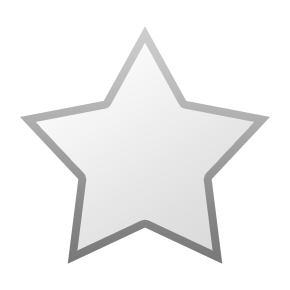 Sadly, I had the absolute worst night sleep I've had in years. It simply will not stay sealed around the bridge of the nose. Wore for three nights, kept my wife up each night with loud amplified snoring, forced to go back to nasal pillows. I had high hopes for this mask. I very much dislike the masks with forehead bar on them, so this is one of a few options I had to try. The reviews looked great, but the mas just was not comfortable on my face and nose. There were hard reinforcement parts in the mask on the cheek and sides of the nose that caused great discomfort when the mask was tightened enough to seal properly. When the mask was left quite a bit lose, my cheeks would not be bruised in the morning, but the mask leaked badly past the cheeks. The nose bridge and nose seal in general were quite uncomfortable on my face even when the straps were not on at all (just holding the mask up to my face). Maybe I just don't have a slender enough nose to fit this mask as designed. I had to go back to my old mask after five days as I had actual purple bruises on my cheeks in less than a weeks time. This mask is designed like a respirator and is the best fitting available mask on the market today if you need a full-face mask; I do because I snore with my mouth open and this mask prevents that. If you are having leaks it is because the mask size is too large on your face. I wear a medium size in all other brands I have tried and use a small size in this mask. The medium leaked, but the small fits perfect! IMO, the mask size runs a size larger than you normally wear. Very comfortable and more durable than all other masks I have tried. Built to last and easy to adjust for a comfortable fit; has a wide and soft face piece sealing surface to prevent leaks and the chin cup prevents this mask from shifting on your face while sleeping.. I have used this model a lot. Those who say it does not fit may not have the right size mask or head gear. Sometimes a medium head gear may be required for a small or large sized mask. You may have to mix and match. Head gear stretches out quickly, too quickly with this model (I had to replace every month)so don't judge the fit of a mask on the first night; the head gear has to initially stretch to it's first "set" and may give you fits (pun intended) for a night or two. As far as the clips being a pain, you get used to it. I finally got to be a pro with those crazy clips on the Amara mask; once it clicked (pun intended) I finally had the hang of it even when half asleep. That took forever but it's just like riding a bicycle - terrifying when you begin without any support, lol. This mask is built like a tank. It says right in the manual that you can toss it in the dish washing machine and I have done so countless times (delicate wash)for a clean mask every night with no work involved. This mask is practically indestructible. Despite being large-and-in-charge this mask is a real softy, having no hard frame. 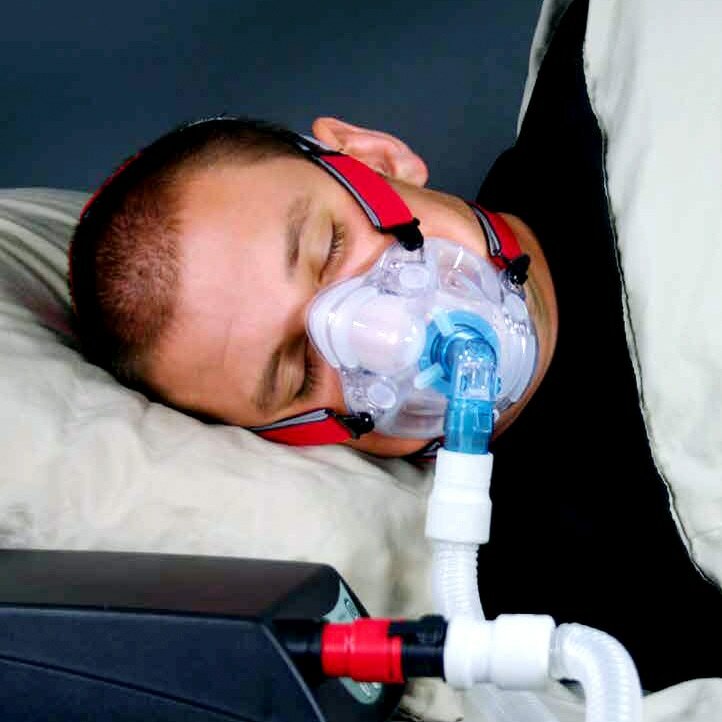 This means it does not like to side sleep without using one of those special CPAP pillows with a cut-out area on the side of the pillow for the mask to "hang out" in. Otherwise it squishes a bit flat, like getting a flat tire complete with a complementary flat tire hissing noise from the major leaking. This mask can be a joy for those who experience a lot of chin drop during sleep and have gone through umpteen masks with no joy. The pronounced under chin design will finally take you to the land of sweet dreams (as soon as you figure out which sized mask and head gear works best, let the head gear break in and make friends with the clips). If the mask begins to leak excessively after a month or more the head gear has stretched out and needs replaced as with all masks. Lastly this mask has no head piece, so no more sore spots on the forehead and it usually works well with a deep set nose bridge so less leaks and skin irritation around the nose bridge for those people. Mask is very uncomfortable, headstrap does not fit around ears very well and is too tight to attemp to get mask to seal which does not do. 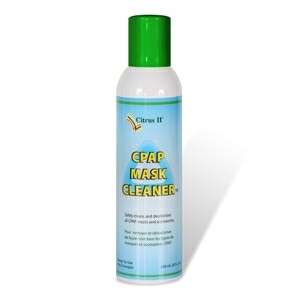 I ordered this mask hoping it would work as well as the one I have been using, which I needed to replace. I absolutely HATE this mask. It's very difficult to take off if you have to itch your nose or cheek. It leaks terribly around my face - I could not get it to seal properly. A total waste of money. I am back to using my old mask. I felt the information for this mask was very misleading. I am extremely disappointed. My first was the original V1 mask. I loved it, but it had issues. I was so happy when V2 came out. HR had addressed the very issues I had with the mask. I am a guy, and as such I do have to make sure to keep my face clean shaven. Any amount of facial hair will cause the mask to drift and loose seal. Also, fit is very important. A sizing template is available, but I would suggest going the next size smaller than what the template will suggest. If the mask is to big, it will not reliably seal and the chin flap will not hold your chin, and therefore will not help keep the mouth closed. I can't bring myself to try any other FFM, because I can't trust it to work as well as my V2. From what I can tell, the others do not have the chin flap, but rather rest between the lower lip and your chin - that's just not good enough for me. The entire mask is a soft silicone mask, not a hard, rigid plastic frame with a silicone pad like so many others. That rigid frame makes sealing a real pain. The soft (semi-rigid) single piece construction of the HR 7600 V2 makes it easier and less painful to achieve a seal. The mask does have 2 support frames that stabilize the mask, but do not contact your skin or cause problems. My only complaint with the HR V2 is the with the headgear. It's made from neoprene and is prone to "spaghetti" strapping and can be somewhat irritating to the skin if you have particularly high flows, since necessarily you still have to tighten the straps a little more than someone with lower flow rates. I recommend using "Pad-A-Cheek Original Micro Fleece CPAP/BiPAP Headgear Strap Wraps", available from CPAPXCHANGE as well (http://www.cpapxchange.com/padacheek-fleece-cpap-headgear-strap-wraps.html). I thought this would be the real answer for me but not so. 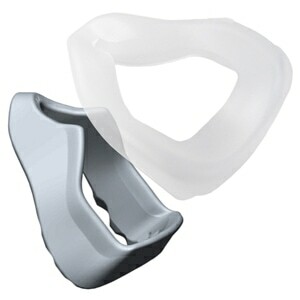 I thought with the part that goes under the chin would be of real help as I have a problem of opening my mouth and with the full face mask I use it slips up and I wake up with it in my mouth thus not getting good treatment for my sleep Apnea. I can't understand why the Hans Rudolph leaks so bad I am not able to sleep. Every time I am about to fall asleep it starts to leak bad. Is there something I am doing wrong? I had tried several masks before coming upon the Hans-Rudolph. I found that the ResMed Quattro I primarily used before put too much pressure just below my lower lip and it was hard to control the leaks. The HR mask removes those issues due to the design. The lower part of the mask goes under the chin and balances there instead of just below the lip. Therefore it eliminates the pressure point under the lip. The seal is quite good and leaks are minimal. I made the mistake of using the REMzzz pads with this mask for a quite a while which led to my machine registering enormous leaks even though I couldn't feel them. Once I stopped using the pads the leak issue was completely eliminated. The headgear is very adjustable and comfortable. The mask itself is one piece of silicone. It doesn't have removable/replaceable silicone pads like most other masks, but I have found that the mask is very long-lasting with daily cleaning. The HR people told me you could even put it in the dishwasher to clean it but I have never felt the need to do that. The main issue with this mask is making sure you get the correct size. It runs a little bit larger than other masks. I really love this mask. It's a shame it doesn't get the recognition or publicity of the ResMed and Respironics masks or even the ones for F&P.